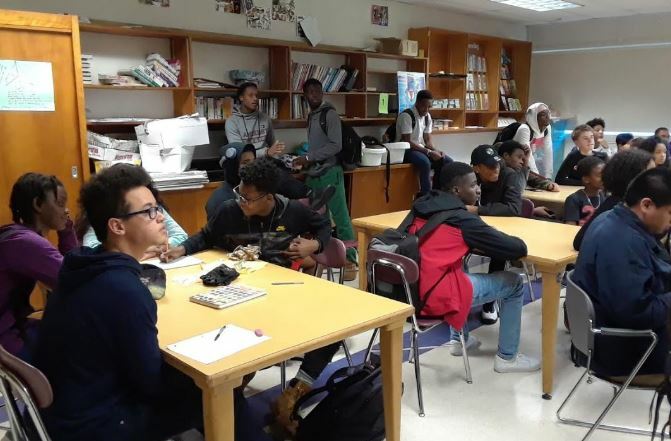 POCU, or People Of Color United, is a club that has been at ARHS for decades. Interim Assistant Principal Mary Custard and health and physical education teacher Elizabeth Haygood co-advise the club. This year’s group has over 50 members, said Ms. Custard, who said it is a diverse group. “The club is open to anyone,” added member Taylen Pope. POCU also has student leaders who occupy different executive positions. This year’s co-presidents are Karrington Dowe and Taylen Pope. The vice presidents are Soul-Jah Gomes Ferreira and Mohamed Abdel-Maksoud. Danielle Beason is the secretary, and Lydia Sullivan is the public officer. The group has many events planned this year, including a field trip to see The Hate U Give, a movie based on a young adult novel by Angie Thomas, at Cinemark in Hadley. The group will be joined by a number of African American Literature classes and other English students. In the past, the group has taken some amazing trips, including to Washington, D.C. to visit the National Museum of African American History and Culture. The club meets every Tuesday at 3:00 pm in room 117. “We discuss current social issues, fundraisers, volunteer work, field trips and building the community,” said Dowe.